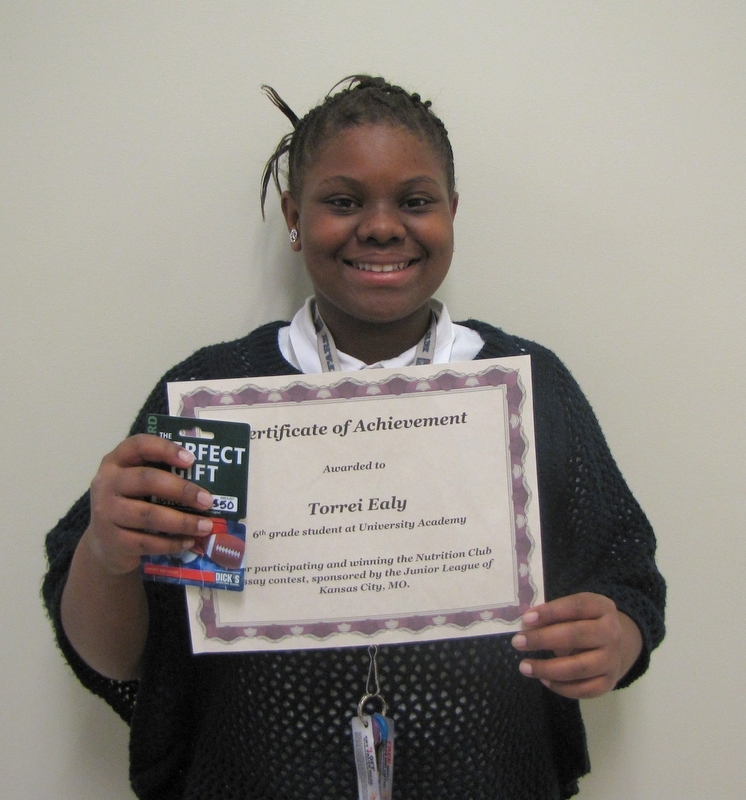 Sixth grade student, Torrei Ealy, wrote an essay about what she likes about the Nutrition Club. Nutrition Club really helps me a lot. It provides me with healthy food so I can stick to my diet plan. You can learn a lot from a label by reading the serving amount, calories, sugars and sodium. I also learned that when you eat dinner you should have fruits, grains, vegetables, protein and dairy with every meal. Exercise will help with your nutrition too; because once you start eating right then your body will want to work out just like your system would want to be clean. Water is a very good thing to drink because it quenches your thirst. I love water, it is my favorite drink. The average person should drink 8-10 glasses per day; during exercise you should drink at least 16 oz. of water. Many people do not realize the importance of water in their lives until they do a little research. Those are a few things that I learned in nutrition club. Nutrition Club is part of the League’s signature project: HealthyU. The pilot program was added last year to the Healthy U curriculum to educate more students about the importance of healthy nutrition. Together with Harvesters, the League provides weekly delivery and distribution of healthy foods to 50 students in 6th-8th grades through the school’s food pantry. In 2012, 50 backpacks were filled every week with vegetables, fruit, milk and juice and given to Nutrition Club participants. Participants can also shop the food pantry for additional items to take home. Nutrition Club highlights from 2011-2012 included a field trip to Arrowhead Stadium’s Sports Lab with catered lunch and visits from Sustainers to the food pantry to assist with fun seasonal nutrition topics. This year, the Junior League looks to increase its impact with the Nutrition Club participants through weekly educational handouts and discussions as well as a fitness event. This entry was posted on April 11, 2013 by JLKCMO in Community Impact, HealthyU and tagged childhood obesity prevention, Community Impact, HealthyU, Nutrition club, Signature program, The Junior League of Kansas City, University Academy.